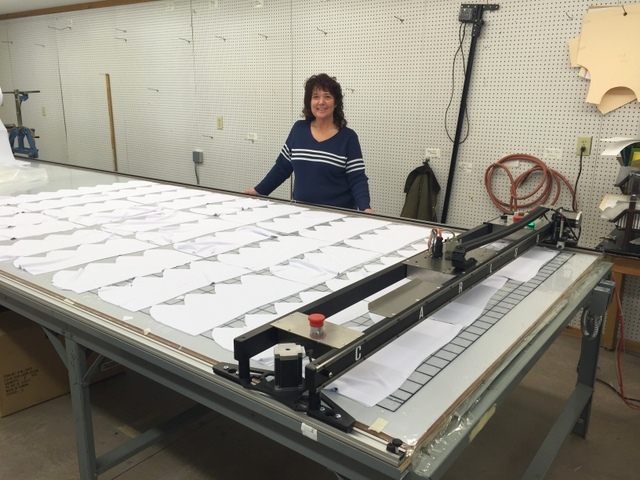 "In February 2015 we installed our PT-72″ Plotter/Cutter and T-Bar Digitizer to help them automate their patterning, marking, and cutting. Vice President, Dan Rusch, said “a summer intern can run us $20/hr without any experience”. With the Carlson Plotter/Cutter they are “buying the labor [they] can’t find.” A simple, affordable, and reliable cutting solution, that shows up everyday and makes the same great marks and cuts every time. " 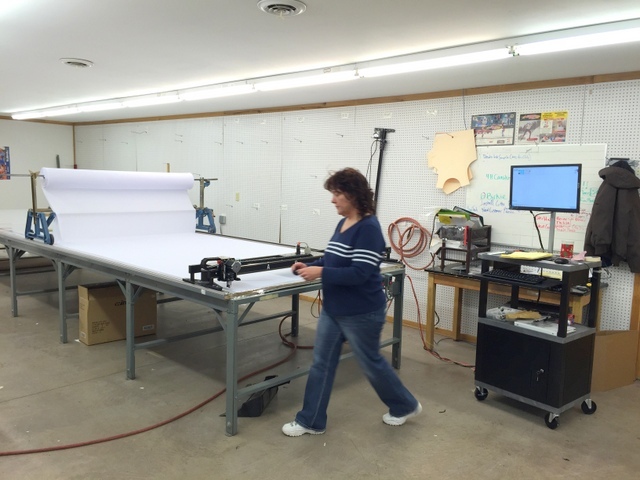 Hidden Bay Graphics, located in the northern vacation town of Hayward, Wisconsin, makes specialty printed sports apparel. Like many successful small businesses they believe in a simple mantra, “supply our customers with quality products for a fair price while giving them superior customer service.” Unfortunately, the small seasonal town of Hayward only has a consistent population of ~2000, which means it can be very difficult to find good cut-and-sew help to live up to their mandate and growing production volume. 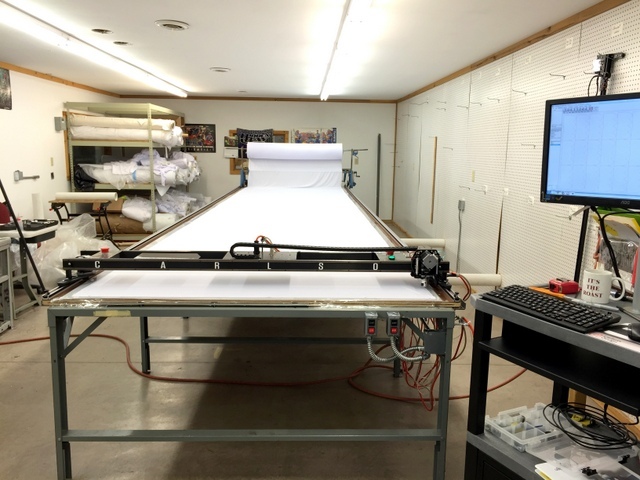 In February 2015 we installed our PT-72″ Plotter/Cutter and T-Bar Digitizer to help them automate their patterning, marking, and cutting. Vice President, Dan Rusch, said “a summer intern can run us $20/hr without any experience”. With the Carlson Plotter/Cutter they are “buying the labor [they] can’t find.” A simple, affordable, and reliable cutting solution, that shows up everyday and makes the same great marks and cuts every time. They are also getting a solution that will pay for itself in the first year! Hidden Bay Graphics makes a wide variety of sports apparel — including custom, medium and large volume production runs of bike jerseys, race jerseys, hats, beanie bands, throat coats, and more. These items are popularly used in races like the Birkie — a famous international cross country ski race held annually in Hayward. 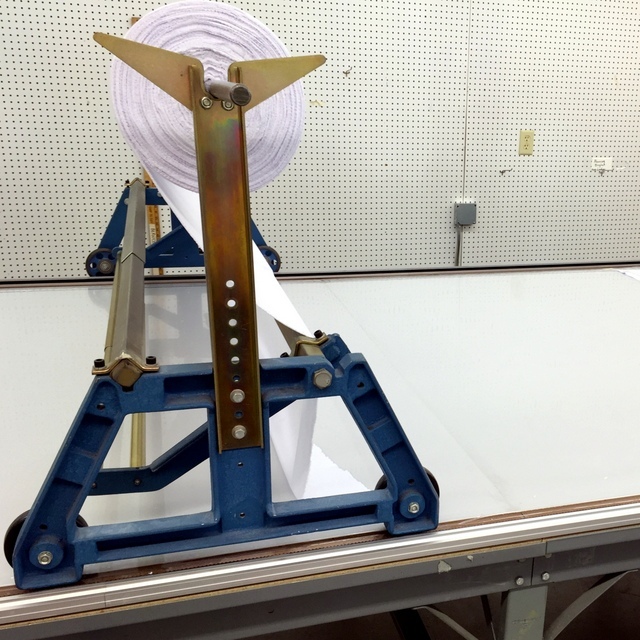 They cut a wide variety of materials and needed a system capable of cutting small and large jobs, out of single-ply and low-ply material stacks. 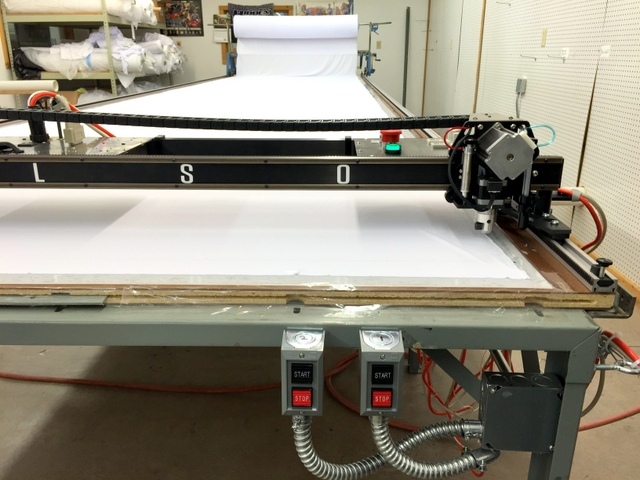 The Carlson Design PT-72″ Plotter/Cutter is capable of cutting up to five ply of certain materials. Hidden Bay works with jersey, nylon, thin meshes, felts, and more. Dan reports, “Lycra we can cut one ply at a time. 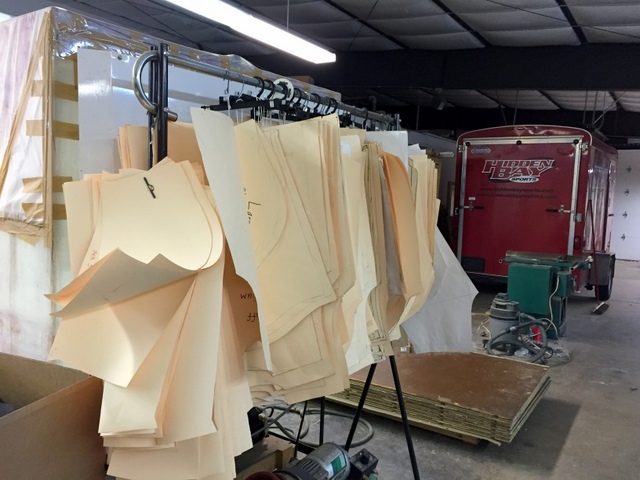 Jersey fabric is three ply.” The more ply you cut the faster your blade dulls, and the harder it is to prevent material shift, so it is important that you test each material to determine the number of layers you can cut. Graded patterns for a standard jersey. The spreader saves a lot of time when cutting multi-ply. Spread table, ready to cut. 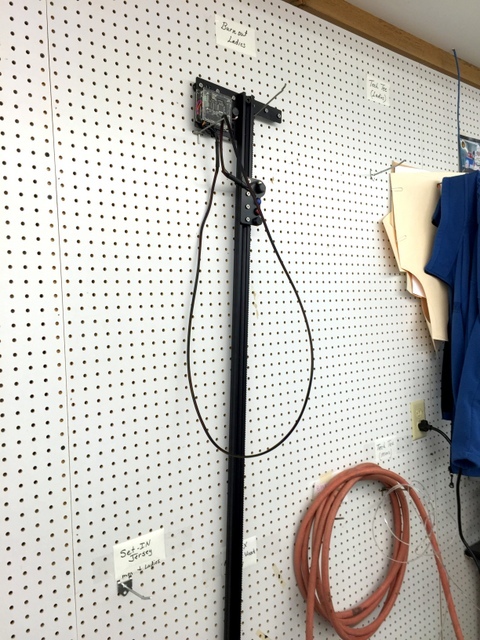 The T-Bar Digitizer can hang on the wall when not in use. It is powered via USB and runs inside of the same program used to control your plotter/cutter, Plotmaster. 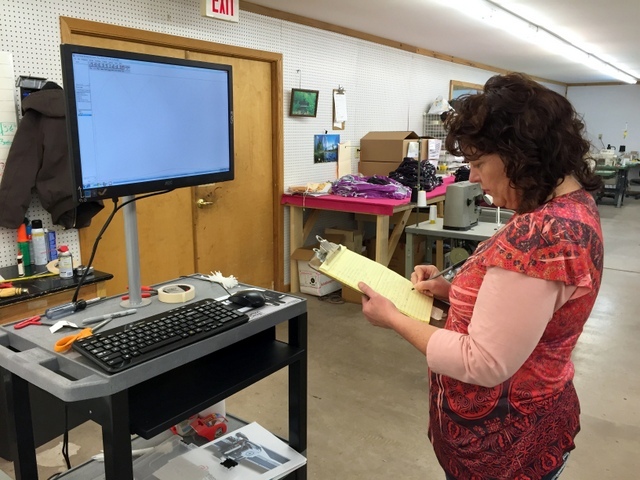 Malinda is Digitizing a hat for an up coming job. Digitizing a pattern is as easy as moving your hand and clicking a record button. 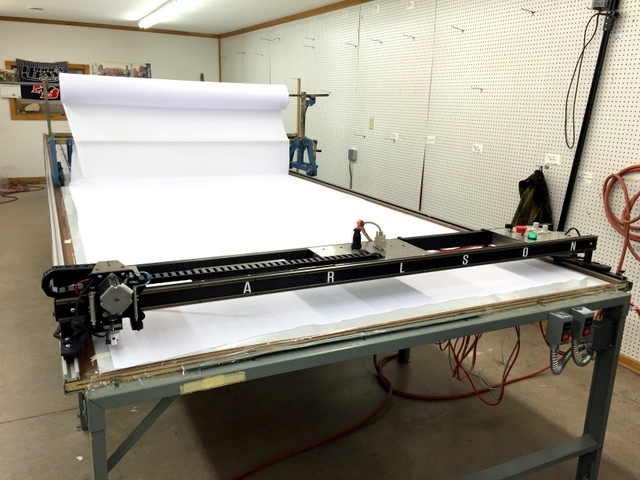 The Carlson Design PT-72″ Plotter/Cutter is designed as a fast, single, or low ply Plotter/Cutter. It uses rolling or drag blades to cut material, which, in addition to vacuum table type, fabric type, and the style of the pattern, will dictate the number of layers you can cut at one time. 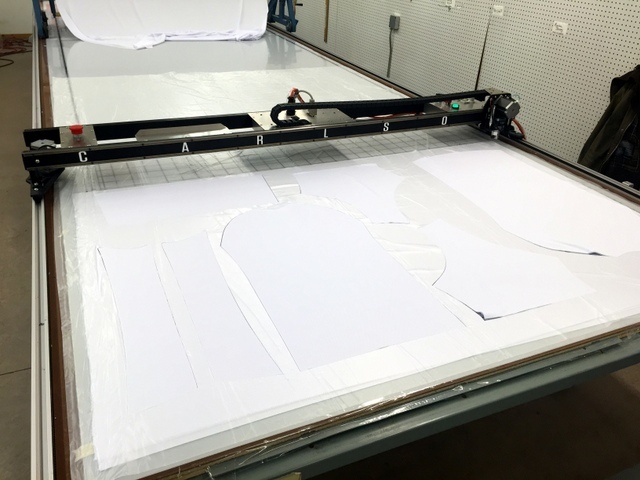 Hidden Bay Graphics is able to cut multiple layers of Jersey, Nylon, and Lycra blends using our High-Lift 28mm steel rolling blade holder, which allows 10mm of exposed blade. 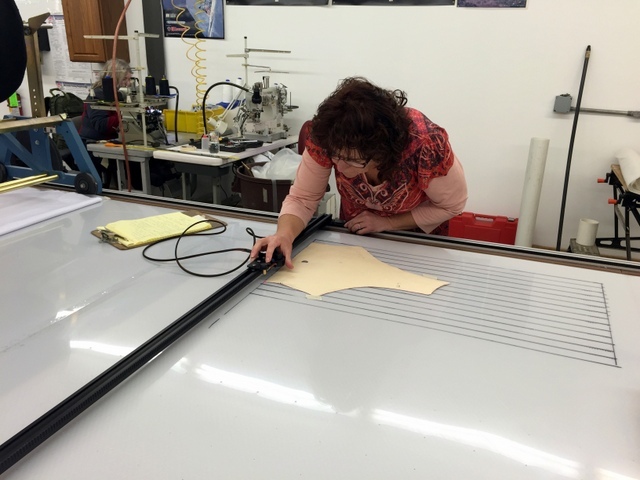 Their material is secured during cutting using a thin-mil .0075″ plastic, two 5HP radial vacuum blowers, and material spreading is aided by an existing spreader that rides between our track system. 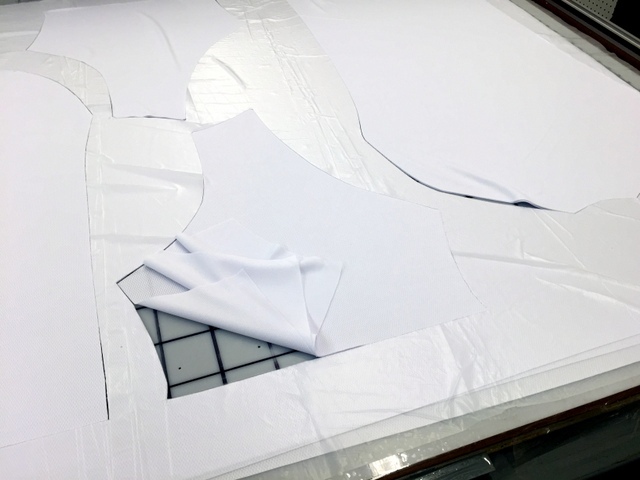 Thicker materials, like felt, are too “slippery” for multi-ply cutting on the Plotter/Cutter or with their hand-held high ply reciprocating cutter. It is difficult to spread, secure, and cut through more than one layer using a rotary blade cutter. We “vacuum bagged” their felt to cut “Beanie Bands” one ply at a time. This was still considerably faster than hand cutting, and much more accurate. What a great looking setup! Blower on/off switches are mounted at the front of the table near the operator’s workstation. Layers are cut quickly and accurately, nested in logical pattern sets. Cutting nest jerseys in one, two, three, and five ply. 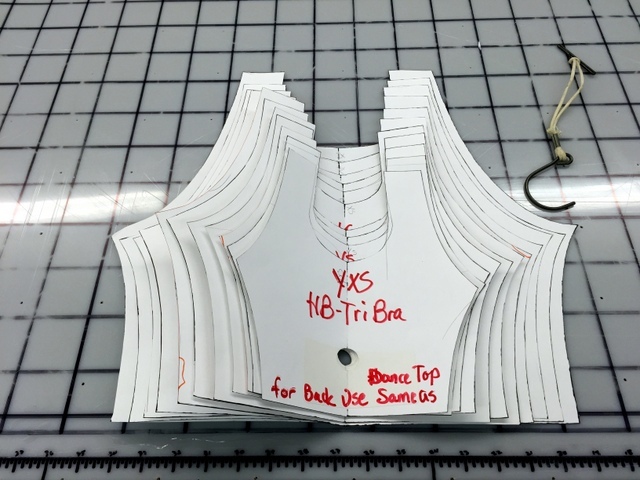 Digitized hat, nested, and cut three ply high.